Students, faculty and staff from all U-M campuses who travel abroad for University-related purposes must have U-M Travel Abroad Health Insurance and register in the U-M Travel Registry. (University-related purposes may include but are not limited to study, research, internships, service, conferences, presentations, teaching, performances or athletic competitions). Computer accommodations aren’t just about the technology. Sometimes, people need their workstations to be adjustable to accommodate their wheelchair, their back pain, or their height. This is a list by country of university and colleges' disability services resources and contact information. If a study abroad program is not taught by a UM faculty instructor, the VISA letter provided by SSD may not apply. To find out about what accommodations are provided for the study abroad program you wish to apply for, here is a list of agencies that can assist you. 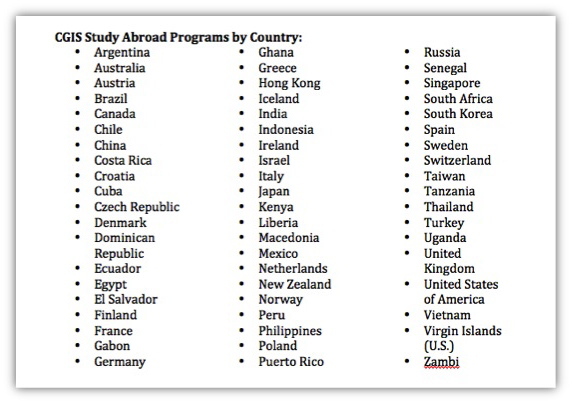 UM study abroad programs taught by UM faculty instructors will accept the SSD accommodations (VISA) letter. The Center for Global & Intercultural Studies (CGIS) offers two such programs.